Do I toss them and move the ingredients I had on hand to make homemade hand soap? OBVIOUSLY, as the title of today’s post already gave it away, I chose the latter… and BOY am I so glad I did! Someone should have told me eons ago that making your own hand soap was SO EASY! You know how your brain sometimes over-complicates things and convinces you that whatever you need/want to do is too hard, too time consuming and/or too expensive? Yeah, that’s what happened here for me. Luckily, making your own homemade hand soap isn’t hard, time consuming or expensive! So let’s go back for a moment when I mentioned debating between packing soap, or the ingredients to make soap. I should probably confess that I’ve had a bottle of castile soap sitting in my closet for… oh… six months or so. In my defense, I really, REALLY planned to make my own hand soap. And then I had to cook dinner… and make toothpaste… and shower and sleep and eat and test recipes and such. So I forgot about making hand soap and just kept using the soap we already had out. I checked it for triclosan and other icky anti-bacteria stuff (which is a no-no in our house), and it was clear. But wouldn’t you know, that darn bottle of castile soap gave me the stink eye every time I opened that closet, taunting me to pull it out and just make the soap already. Packing up all of our stuff and moving across the country was basically the kick in the pants I needed. My Konmari frame of mind meant not packing both 4 unopened bottles of soap AND the castile soap and pretend I didn’t have time to at least attempt homemade hand soap. Yes, I was busy. Giving away all our stuff over coffee and donuts is hard work. But for real, how difficult could it be to mix TWO ingredients together in a bottle? Or at least make the attempt and rule it out if it didn’t work. And I instantly felt like a dummy. Just 2 ingredients. You can add a third if you REALLY want to, but it’s not necessary. Just 2 minutes. For real. The most time consuming part is cleaning out the foaming hand pump, but if you go the traditional pump route instead of a foaming pump, your 2 minutes just became 1. 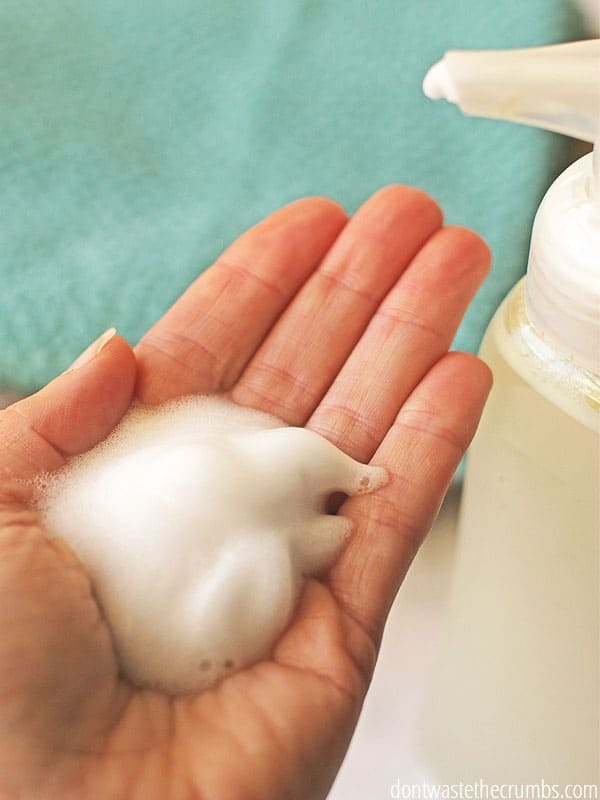 Whatever may be stopping you from making your own hand soap, just ignore it. You’ll kick yourself later when you do finally end up doing it, because you’ll realize how crazy easy it is and wish you had done it sooner. It’s easy. Yes, that is totally a legitimate reason. It only requires 2 ingredients. Again, legit. You can make more anytime you run out or just want/need more soap (thanks to #1 and #2 above). It’s no skin off your back, and no addition to your shopping list. It’s 100% natural. As in no chemicals, no colors, no dyes… just pure ingredients. It works. This isn’t some wanna-be hand soap. This stuff cleans.your.hands. I’ve got a kid who thinks her hand is an art canvas to prove it. It multi-tasks. Mr. Crumbs has been asking me about a body soap lately, so I gave him this hand soap as a joke. Joke’s on me – he loved it! Fill an empty 8 oz container nearly full with water. Add 2 Tbsp liquid castile soap to the top. (Adding the soap first will create bubbles, so do the soap last.) Replace the cap and wash as normal. 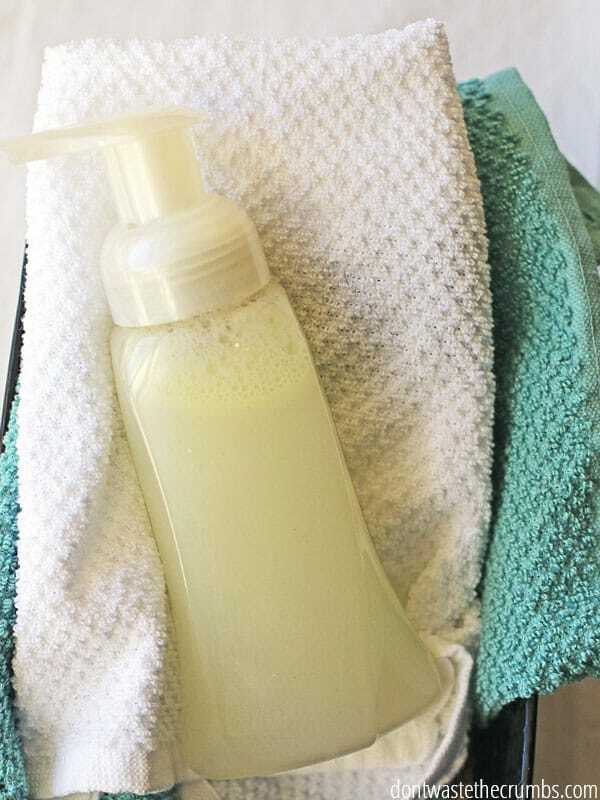 Tip: If the castile soap settles at the top or bottom, gently turn the bottle upside once before dispensing. You can use whatever container you have – I happened to have foaming hand soap back from my couponing days. I’ve also seen foaming hand soaps at my dollar store (ignore what’s inside – you just want the container). If you prefer brand spankin’ new, here are some cool foaming soap dispensers on Amazon. If you follow my footsteps with a “used” bottle, you’ll want to clean out the dispenser. Fill a glass with water and over the sink, “pump” the water through the dispenser in order to clean it as best as you can. This is tough, as the foaming dispenser will keep giving you foam… making it hard to discern whether or not the remnants of the old soap are truly gone. Personally, I went through about a cup of water and called it good enough. Any more than that would have driven me batty. If you don’t want foaming hand soap, just use a regular pump. The pump is what makes soap foamy, NOT the recipe. So just go about your business, mix it up and pump away. Although I do still recommend cleaning the pump from the old stuff using the method above. Really, the combinations are endless. And I think it’s neat that you can create whatever scent you want, whenever you want. Shoot, you can make every bathroom smell different if you wanted to! I found tea tree scented castile soap for as low as $13 for a 32 oz bottle and if I found that when I was in the market, I would have bought it. Alas, I found peppermint castille soap at my local Costco. PS – In the end, I gave away two of the store-bought soaps and cleaned out the other two. I packed one empty for Georgia (along with my castile soap) so it’s ready for me when I arrive. The other I kept at home full for us to use until we leave. 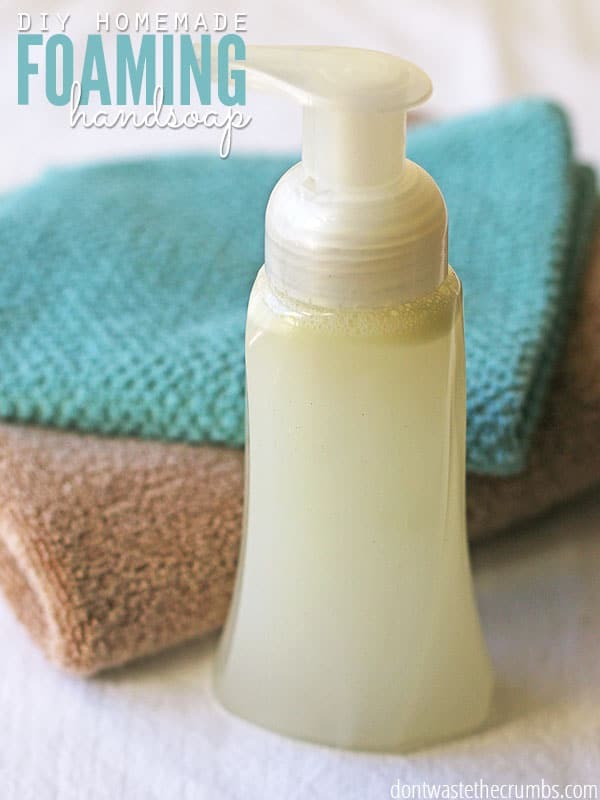 Have you ever made your own hand soap before? What is the consistency of this soap? I don’t have any foaming dispensers and overly watery soap tends to just slide right off your hand when soaping up. This is a thinner soap Heather. Your homemade bar didn’t make liquid soap well? Mine has always been on the too thick side – odd! 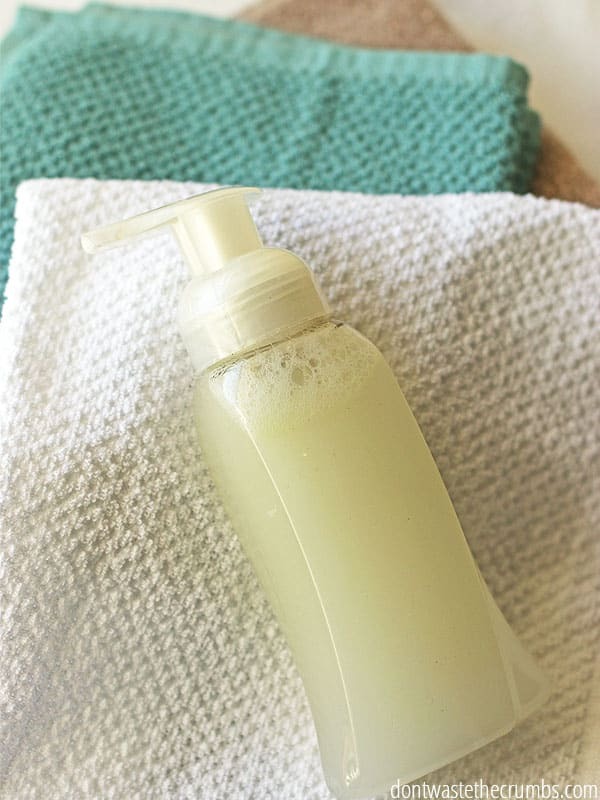 I have been making my own foaming hand soap for years now! One of decisions that opened the doors to a ton more natural/DIY/from-scratch things I do now. I do the “recipe” you have and then add a squirt of sweet almond oil, and 5 drops each of tea tree oil and lavender oil. My recipe also calls for some Vitamin E oil, but I haven’t had any of that in my house for quite some time, and it still works out nicely. It’s nice to have some of the moisturizing oils in there, since Castile soap has a tendency to dry out the skin (and I wash my hands a TON with 2 in diapers, and another still giving me potty-training grief). My experience making it without the foaming dispenser is that it will harden up around the nozzle, and then when you pump it, liquid soap will shoot out in unpredictable directions, including once into my eye… So I definitely recommend the foaming pump, lol!! LOL – thank you for this tip Ann! I got a large bottle of Peppermint Dr. Bronners from Costco for like $10. I have been using that bottle to make foaming hand soap for about a year now. I did buy a bottle of distilled water to make it with too. I also use the distilled water for a few other home made items including toner. I bought my foaming dispensers from aromatools.com. Super cheap! I use a little more soap than 2TBS because I like it soapy and my hubs complained that the 2TBS in the dispenser at the kitchen sink did not cut through grease. But still, it’s a really good deal and lasts a long time!!!! It does last a long time! I hadn’t considered using castille soap for cutting grease on dishes – thanks for the idea Alicia! I’ve been using this recipe, proportions variable, for over 3 years now. We used to have various fancy dispensers which never dispensed it well. I ordered what I thought were foaming dispensers on Amazon. While they didn’t foam, they dispensed fine. Until they broke in less than 6 months. I almost ordered another set but I ended up cancelling the order just before going for a vacation. We used Airbnb and the hosts had hand soap in….dial complete foaming dispenser. I went ahead and bought 2 containers after coming back (no dollar store near enough to make it worth my while to go just for a few foaming hand soaps). I couldn’t bring myself to toss the liquid out. It’s almost all gone. I’m going to mix up some peppermint Castile soap in the dispensers. Our Costco has only peppermint dr. Bronners. I wish they’d have tea tree or eucalyptus but they have the best prices of any I’ve found, including on Amazon. So… Bottom line. Dial complete dispensers. They look good. In my student days, I used soft soap hand wash and refilled many times, without the container breaking. Hopefully, dial will do the same. I’ve had multiple pumps from different places and they always seemed to break down after a short while. Someone tipped me off to adding 1tsp of Fractionated Coconut Oil (olive is what I used) to the mix. It helps the pump stay working by lubricating the mechanism but it doesn’t make your hands greasy. i make facesoap in mine. lavender dr bronners and tea tree oil. you need to shake the bottle every use or the oil stays in the bottom. ive made face soap for about 20yrs now. the foaming soap for hands never has enough soap in it for filth n grease. adding more soap clogs the dispenser — for me anyway. we use dr b’s for our body soap (diluted in half) so its always on hand to put in the lil bit needed for the face soap. i’d love to use it for clothes with borax and washing soda, but All Free is just waaaay too much cheaper per load in the 3x concentration and dont need to buy borax and washing soda besides. dr b’s makes great produce wash too i hear, heavily diluted. I am guilty of this very same thing and my bottle of Castile has been giving me the stink eye mask… I usually use dawn to refill my soap dispensers, which to my knowledge is safe and gentle? I should check that out, just bc they use it on baby birds doesn’t mean it’s safe and gentle, but that was my thinking.. anyway, my cheap old soap dispensers have lasted years with it, so I hope this “recipe” will be just as forgiving! I have never used a ‘foaming’bottle and I do believe they are good… but, I have made my own soap, both bar soap and liquid soap- from scratch for 15 years, may I add ALL soap is made with Caustic Soda and oil, yes even Castile soap. In saying that making soap from scratch is quite a task and it is dangerous if you don’t take certain precautions. But you do get to use a beautiful soap and you know what is in it!!! May I suggest in making foaming soap as told above, every drop of oil you put in the bottle lessons the foam, may I suggest you put 2 drops of glycerine in the soap foamer instead of perfume, glycerine is so good for the skin, it draws moisture from the air and keeps your skin soft. All commercial soap has had the glycerine removed, so put it back in, you will notice the difference. I am a firm believer in DIY body products, I shudder when I see people going down the shopping isle looking at body creams etc. they have no idea what they are buying. But….enjoy your ‘homemade soap’. I like to add a tablespoon of oil to this recipe for moisture. I also add a little lemon oil to whatever other essential oils I use since it helps with grease when I’m washing the dishes. I’ve been using this recipe for a few years and recently started adding a teaspoon of fractionated coconut oil to add a little moisturizer. I love it! But I have noticed my bathroom sinks tend to get a film in them that I really have to scrub to get off. Had this happened to you? Not sure if it’s the Castile soap or what? It was happening even before the addition of coconut oil so I don’t think it’s that. Thanks! I’ve been using the same mix and haven’t noticed any build up (unless I skip cleaning for a couple weeks). I use a green scrubby if I notice any build up and it comes right out. Hey Kathy! It took me a few weeks to transition from traditional cleaners to oils, but I now use them for EVERYTHING and don’t buy any personal hygiene or cleaning products at Walmart or Target (or Amazon or Grove). I either make them all myself, or buy them from Young Living if it’s too complicated for me to make. It’s hard to explain “using them enough,” but if you consciously think about how often you reach for a bottle or an over-the-counter something, I now use oils instead… so they’re definitely not sitting on my shelf going unused!